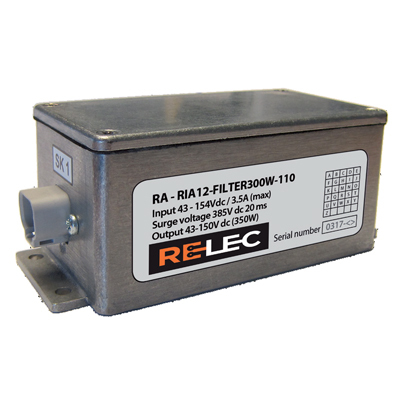 The R series RIA 12 filters are designed to be used in conjunction with a dc-dc converter or other equipment rated at 150 watts or lower, which will allow it to meet the surge and transient requirements of RIA 12. The input to the module has an extremely rugged input filter with full reverse polarity protection built in as standard. The filter absorbs the surge energy, whilst continuing to provide uninterrupted regulated dc voltage.